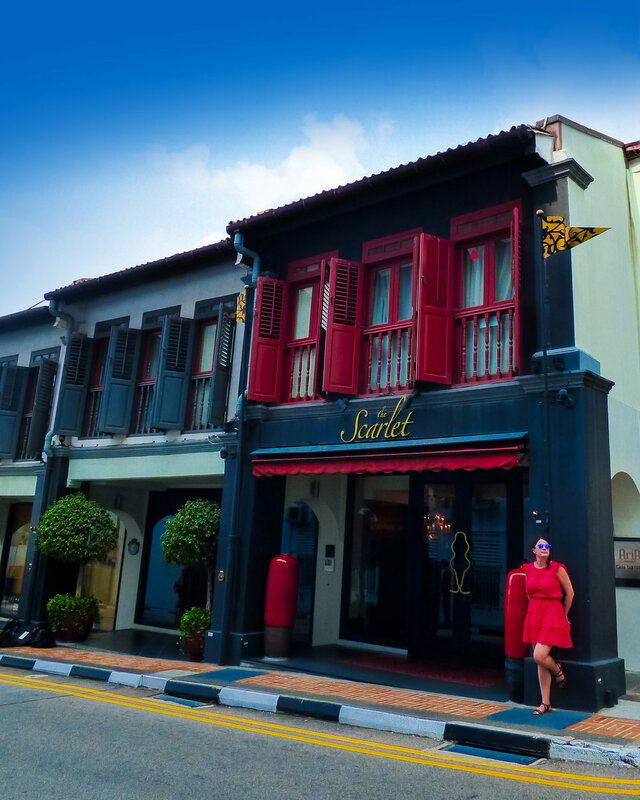 Our first stop in Singapore was at a historic, boutique hotel called Scarlet Singapore. We were coming directly from the airport, using the MRT (underground) to get to the hotel and found it quite easy! From Chinatown station it was about a 10 minute walk. They are currently doing work across the street from the hotel to add a new MRT station, when that is completed the MRT will be even more convenient than it already is. Chinatown is a beautiful, vibrant, and historic area of Singapore. 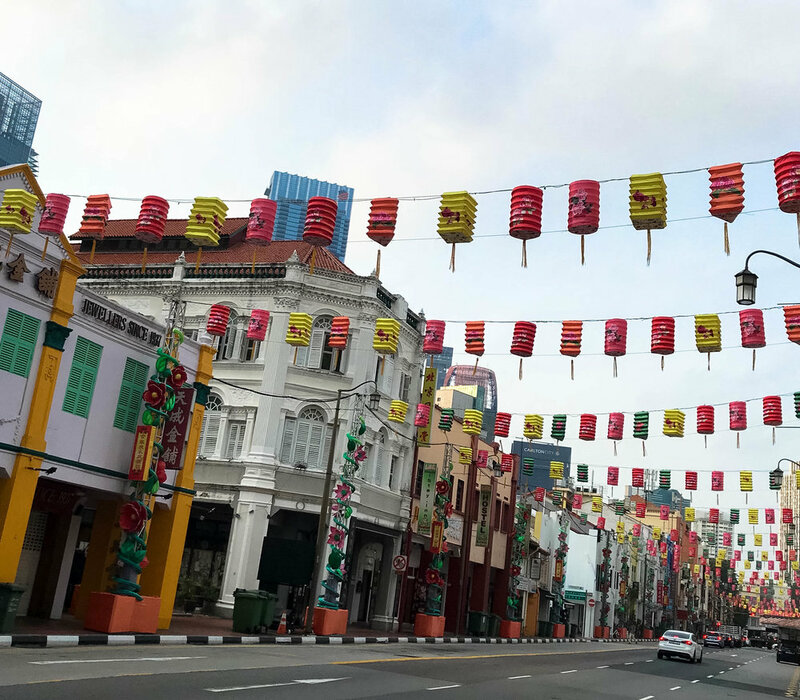 Definitely a good starting point for the city, you’ll be able to explore an older area of the city which is quite colourful, and full of temples and shophouses. There are loads of fabulous options for eating including one the most highly rated Hawker Food Centres called Maxwell Food Centre, which is situated directly across from the hotel. Hawker Centres are the perfect way to try local dishes at an affordable cost and are an absolute must do when visiting Singapore! The hotel is also an easy MRT ride and short walk to all the major attractions in Singapore such as Marina Bay Sands and the Gardens by the Bay. Because of the historic nature of this hotel, and that it was once many different buildings- it means that each room is different and unique. The rooms are divided by room type (Deluxe, Executive, Premium and Suites), each room type has similar colours and styles with different layouts for each depending on where it’s located. We stayed in a Premium Room which felt large and roomy. It was primarily brown tones with accents of orange, black and yellow, and red (middle photo above) with a small balcony facing the back of the building and very large bathroom with both a large bathtub and shower. The room felt spacious and cosy at the same time and was extremely comfortable and quiet. There’s a really interesting history behind this hotel, but because of this it also means there are strict regulations to the work and changes they can make to the structure of the building, which means they were unable to put in a pool. However, there is a deck with hot tub and loungers if you’re looking to spend some time relaxing in the sun. There is also a rooftop bar with absolutely stunning views of the city, you absolutely can’t miss going up here if you’re visiting the hotel. There is also a restaurant on site which has daily breakfast, but we didn’t visit here during our time at the hotel. You’ll also find a small but well equipped gym. 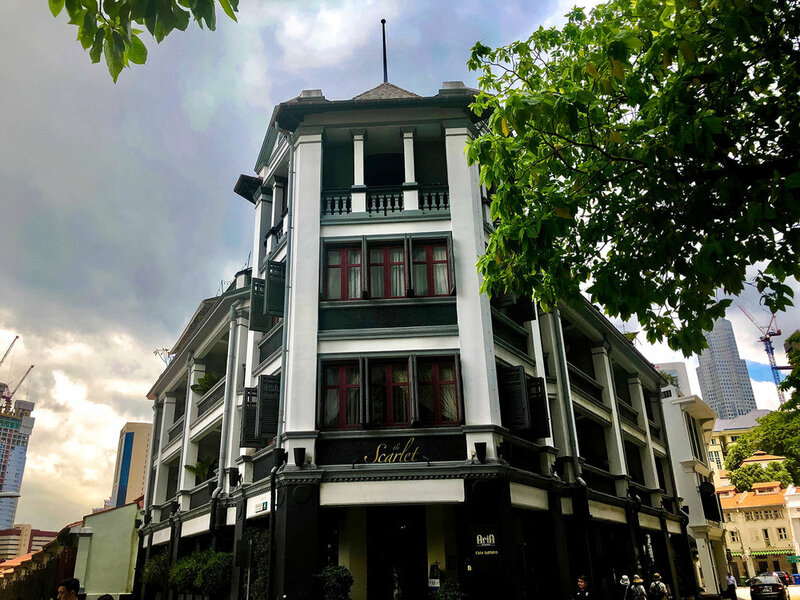 Combine the location with the original and unique design of this hotel and we’d absolutely recommend this as a great place to stay while visiting singapore! Although this blog post was a collaboration with Scarlet Singapore, all opinions are our own.